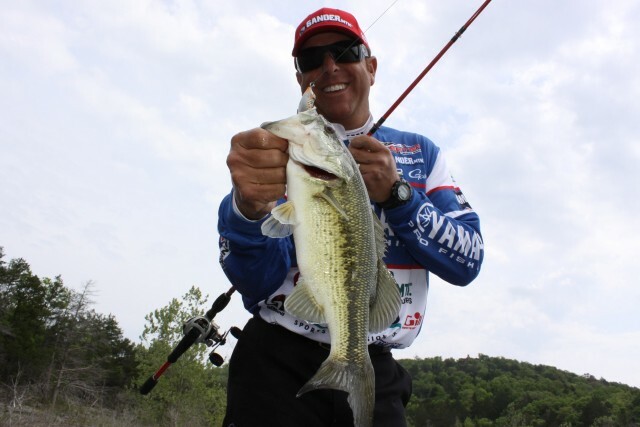 I started frog fishing many years ago, and it has always been one of my favorite ways to catch bass, but to me, the frogs available always were less than ideal for the way I liked to fish them. I like to look at a piece of cover and try to visualize where the biggest bass in the area might be positioned, and put it there. If that means throwing the frog over, around, under and through cover, then I will. Not every frog would do exactly what I needed it to do. I needed a bait that would skip cast well, walk in a side to side motion on the water and hook the vast majority of the fish that bit it. Before I started working with SPRO, I found baits that did one or two of the things well, but they weren’t the whole package. When SPRO and I got together, the problems I had experienced with other frogs were solved. 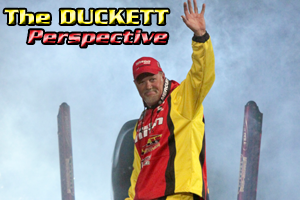 Through a great deal of research and development, we came up with a bait that I could put way back into cover, have the type of action I was looking for, and drag the fish that bit back to the boat. There are several reasons why the SPRO Bronzeye Frog is the most effective bait of its type in the country, and thousands of anglers across the country have responded by putting Kermit into their tackleboxes, onto their rod tips and into their arsenals. 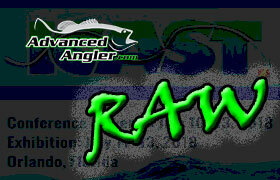 The reason is simple, Kermit just flat catches bass; big ones. The design of the bait is not an accidental thing, and neither is the way I fish it. 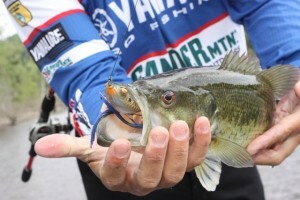 The whole process of designing the bait was built around the way I fish it, and I am here to help people understand why it was produced, and how to catch more fish using my favorite lure. While many companies build a lure, then attach hooks to it, SPRO and I did things in reverse; the hook was our starting point. Knowing that I wanted a frog that would hook the majority of fish that struck, we started with the best hook available, the 4/0 Gamakatsu EWG Double Hook, and built the Bronzeye around it. Our objective was to create the best shape for castability and action, but would clear the hooks enough to penetrate on the hookset. It took us three or four different variations to get it right, but we came up with the results I wanted. I didn’t want a flat bottomed frog; I wanted one that had some contour to it. What we settled on was one that had some roundness to it, and the result was that I could skip the frog way back into cover, and would “walk” well around the cover. A frog with too flat of a bottom will move forward too much on a retrieve and leave the strike zone too early. Once a fish blows up on the frog and takes it down, the body is soft enough to collapse, allowing the sharp Gamakatsu hook points to fully expose themselves away from the body and enter the bass. I’ve experimented, and the Bronzeye has the best hookup ratio of every frog on the market, I honestly can say that I catch more than 90-percent of the fish that strike the lure. bright red one that I designed specifically for this technique. The rod has tons of backbone, but features a very quick tip that allows me to place the lure exactly where I want to, allows me to walk it just right, and still allows the fish to take the lure down. There are others that will work I’m sure, but this one was designed to be perfect for this application. 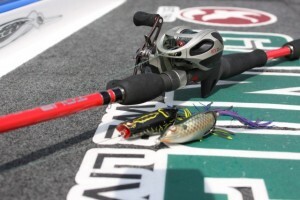 I use a Quantum EXO Burner reel with a 7.3:1 retrieve speed, and I spool it with 60-pound-test Sunline FX-2 braided line. The heavy line is important because its low stretch helps me walk the frog better, but it really is important because when a bass bites in the heavy cover I put Kermit into I need the power to get them out. The reel is important too, for two reasons. First, when a fish strikes the Bronzeye Frog, they are hot; I mean really hot. They can move so far, so fast that I need to be able to pick up a lot of line in a hurry to stay in contact with them. 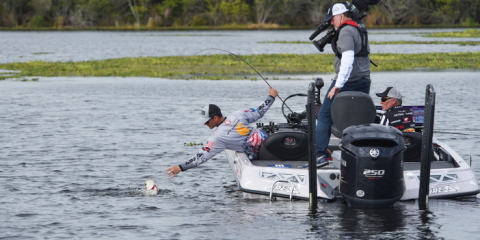 When I used a 6.3:1 reel, there were times that a fish would blow up and come at me so fast that I could never catch up to them; the high speed reel helped solve that. There has been people ask if the faster gearing affects about the power of the reel, but I haven’t found it to be a problem. 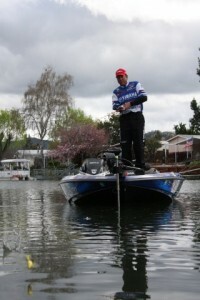 I use the rod for leverage more than the reel, and the speed is more important for control. The other reason I use the high speed reel is to be more efficient in covering water. When I am casting, I am fishing targets that may only be four or five feet in size; the higher speed reel allows me to work the lure around the cover, then quickly bring the bait back in to make another cast. This saves me time on each cast, and allows me to make more presentations each day. SPRO and I came up with a bunch of colors for the Bronzeye Frog, and I carry all of them with me. I have a few favorites that I go to, but will mix all of them in when the conditions call for it. The way that I choose is to look at the conditions. I factor in sky conditions and water clarity, as well as the forage that the bass are feeding on. I have some basic factors that go into making my color decision, and it goes something like this. In low light or overcast conditions, I choose blacks and browns; as the sun comes up, I tend to move towards whites and greens. We also have specialty colors that mimic bluegill and crawdads, and those for specific regions of the country; we’ve tried to give everyone something they can feel comfortable with. If I had one color that has become my go to, it would be Midnight Walker, the all black one with the bright red eyes. This is the color I turn to when I need a kicker bite to push me over the top; I’ve caught more big fish on that color, and while I know I’m not going to get a lot of bites on it, I’m usually going to get some really good ones. SPRO did a great job bringing life to the colors I wanted, so I don’t really do any coloring on Kermit when I throw him, but I do make a couple of changes to make him a little bit better. I trim the legs back about 3/4 to one inch to make it a little easier to walk because it does help some. The other thing that I do is use a pair of pliers and open the hook gap just slightly; about 1/16th of an inch. It may make the bait just a little less weedless, but when the cover is more sparse, it can help slightly in the hookup ratio. I try to tell anyone who wants to know how to catch more and bigger fish on the Bronzeye Frog to do one thing; get imaginative with your casting. The key that I’ve found is to put the bait in places that most other people won’t throw a nine dollar lure. Don’t be afraid to flip, pitch, toss and skip this frog under docks and trees, over cables and weedbeds and through heavy wood cover or tules; it will come back out. Kermit floats, so it’s not like it’s going to sink into the cover and disappear from existence. keep too tight of a line to the bait when they twitch it; you need a little bit of slack line to make it move side to side; if your line is too tight, it will only pull straight towards you. Leave a little slack in your line and the nose of the bait will move back and forth with each twitch of the rod. The other thing I suggest is that people think of Kermit like they do when they go bobber fishing. It is a very visual approach, and all you have to do is wait for the float to go down and set the hook hard, keep steady pressure on them and grind them to the boat. I take a lot of joy from the stories people tell me of their favorite frog fishing experience. The other thing that really means a lot is to hear fathers talk about taking their kids fishing because to the frog; kids love to fish it. Kermit’s got his own persona, he’s kind of mean looking, and has a little bit of an attitude that kids seem to love. Over the years, we’ve put out new sizes and a popping version, and this year we’re going to have another new addition to the Bronzeye family at ICAST, I can’t tell you what it is yet, but I know you’ll like it.